Recently, the cameras on board the Cassini spacecraft caught images of meteors racing through the rings of Saturn. Or, rather, photos of the clouds of debris created as the meteors impacted the icy ring particles. These meteors were probably a lot smaller than the Chelyabinsk meteor—-let alone the monsters that rained onto Jupiter—-being perhaps only a yard wide. The bright streaks visible in the the first pair of Cassini images were photographed in August 2009. They weren't noticed until recently simply because they are so hard to spot. But the large number that has been found is evidence that these are not rare events. One reason these had not been observed before is that the bright clouds of particles are difficult to see against the background of the equally bright rings. The stand out more distinctly when the sun angle is very low, as it was when these photos were taken. When the sun is almost directly in line with the rings, a cloud of dust rising above the darkened ring plane catches the sun's rays directly. The contrast with the darker background now makes the cloud more easily visible. When the ring background is at its usual brightness, impacts such as these are very difficult to detect. 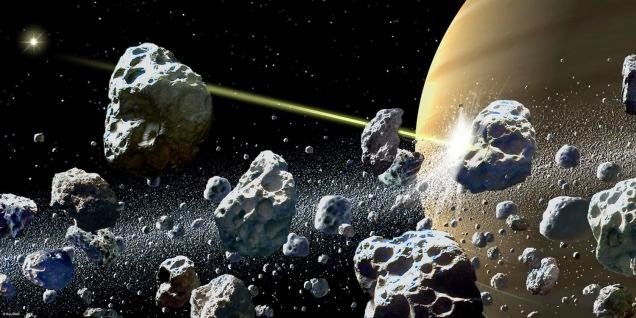 The impact of these objects, estimated to about 3 feet wide and traveling tens of miles per second, created clouds of tiny particles that were then stretched into long streaks by the motion of the rings.